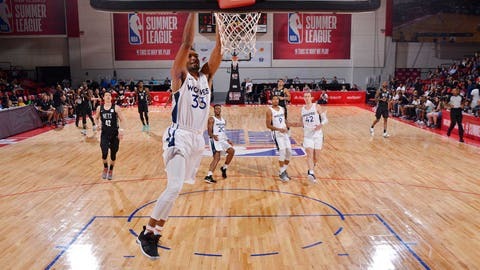 Only three players scored in double figures for the summer league Minnesota Timberwolves (2-1) on Monday night, but it was enough to beat the Brooklyn Nets 78-69 in Vegas. First-round pick Josh Okogie finished the night with 11 points off 4-of-13 shooting (1 of 5 from deep). Okogie also tallied five rebounds, four assists and three steals. Keita Bates-Diop, selected 48th by Minnesota in the 2018 draft, filled out the box score as well — 11 points, six rebounds and four steals in a team-high 34 minutes. He nailed 2 of 5 attempts from 3. Also starring for the Wolves was Amile Jefferson, who registered just five points but led the team with 12 rebounds and four blocks. The Timberwolves shot 35.7 percent from the floor and 23.8 from beyond the arc (5 of 21) Monday. Brooklyn didn’t shoot much better (35.2 percent from the field), as all five of its starters failed to score in double figures. Minnesota started Bates-Diop, Jefferson, Okogie, Charles Cooke and Jared Terrell. The summer league tournament begins July 11.